Beautiful accommodations in the heart of the marina district, walk to restaurants, 5 minutes to Puerto Vallarta or charter a yacht! You'll stay in luxury, but you'll be just few steps from real Mexico. Located in the Marina district with quality restaurants within walking distance, you're only a ten minute taxi ride from shops and the center of Puerto Vallarta. The Mayan Palace is located right on the beach. You can stroll around and admire the yachts.Or use some of the money we are saving you to splurge and rent one for the afternoon! Luxuriate in a one or two bedroom suite. 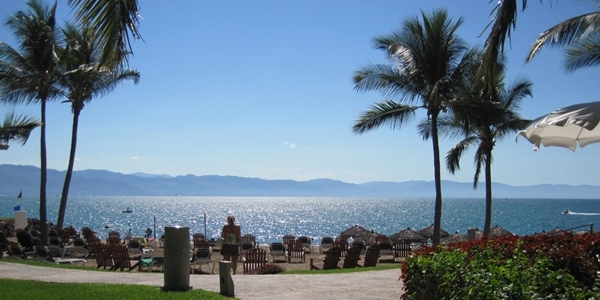 Beautifully tucked between the Mountains and the Pacific Ocean, Puerto Vallarta has retained its Mexican flavor. You can stay in comfort without having to remind yourself you're in another country. It's a world away from the hustle and bustle of an American Resort. Check out our surprising rates. As owners at the Mayan Palace Puerto Vallarta, we can make your "vacation in Mexico" dreams come true at a fraction of the normal cost. We are able to make luxury affordable. A friend of mine is a bit of a workaholic who seldom takes a real vacation. His daughter and son-in-law bought a time share in Puerto Vallarta and invited him along for a vacation in Mexico. After a week in Puerto Vallarta, he came home tanned and mellow; almost beyond recognition! His time in the cafes, shops and on the beaches of Puerto Vallarta was such a relaxing experience, he breaks into a wide quiet smile every time he mentions it. Your stay at the Puerto Vallarta Mayan Palace will put you close to the small cafes and shops that infused peace and quiet into my friend. Renting a week at mayan Palace Puerto Vallarta could change you for life! OK, maybe not, but you will have a blast!